The schematic symbol images shown below are provided in our free schematic symbols download which you can find here. A multiplexer is a network that separates signals from a common port to other ports, sorted according to their frequency. A diplexer is a pair of filters arranged in a three port network, such that a signal at port one will be delivered to port 2 if it is a certain frequency band, and delivered to port 3 if it is in another frequency band. Not to be confused with a "duplexer", which is another word for a circulator. A way to remember which word applies to which device... diplexer has an "i" in it, so does the word filter. Duplexer has a "u" in it, so does the word circulator. Triplexers are four-port filters, where one input is split into three different frequency bands which each have a dedicated output port. Somewhere out there there are even higher orders of multiplexers, but we've never run across a "quadraplexer." One method of creating a higher-order "plexor" could be to directly connect three or more filters together at a common port, which could be difficult when you consider that the filters that are rejecting must not load the filter that is passing the signal. One method that is often employed is to cascade two diplexers: the first one captures band 1 at one port and a composite of bands 2 and 3 at the second port. A second diplexer separates out bands 2 and 3. One fact about multiplexer usage is as follows: in wideband systems, often you need to carve up the bandwidth to fit available components, or to facilitate an up-conversion or down-conversion scheme. Multiplexers are used to separate the various bands. At the cross-over points in a continuous band of interest, the adjacent channels will have equal response in passing and rejecting the signal, ideally 3.01 dB. Thus there is a certain amount of dead zone in a wideband system. You might want to carefully pick where this occurs. In some cases, multiplexers don't use bandpass filters. 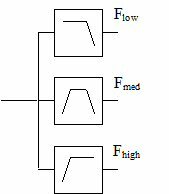 You can make a "waterfall" multiplexers using low pass or high pass filters. Low pass waterfalls are better, as you will note from the following.... the first filter routes out the highest frequency band, the second filter routes out the second band.... on down the line until the lowest band is routed. In this manner, the highest frequency goes through just one filter, while the lowest frequency goes through all of the filters. This favors the loss of the high band. At the low band, chances are the filters are less lossy, and you can get nearly equal loss across the band. If you made a waterfall of high-pass filters, you would have very low loss at low frequency and very high loss at high frequency. Singly terminated filters are a key to making multiplexers and not have one filter load the other filter. You can learn more about this topic and obtain design examples in Matthaei, Young and Jones. At the crossovers in a multiplexer, the signal amplitude will be 3 dB down (50% power split), as it is split between two filters. Conservation of energy applies to microwaves too! The word "switchplexer" is a portmanteau of "switch" and "multiplexer". It is sometimes used to describe a combination of switches and filters, often associated with multi-band operation in cell phones. For N filter channels, the switchplexer has N+1 ports including the common poet which is typically connected to an antenna. The word switchplexer is a trademark of Murata corporation, so you don't get to use it freely. If you read the Murata patent, they have 33 figures that claim everything but the kitchen sink. Perhaps the one thing they could NOT claim is a figure of a switched filter bank, which has two ports, two switch banks and a set of filters Many patents use the word "switchplexer" without crediting the trademark, you'd think that the United States Patent Trade Office would search patent applications for misused trademarks and reject them.